Are you looking for a simple way to make extra money on the side? Do you like to play games online? Would you like make money doing so? Believe it or not, you can get paid to play games online in your free time. You may think games are a waste of time, but there are many legit websites that let you play games for money. 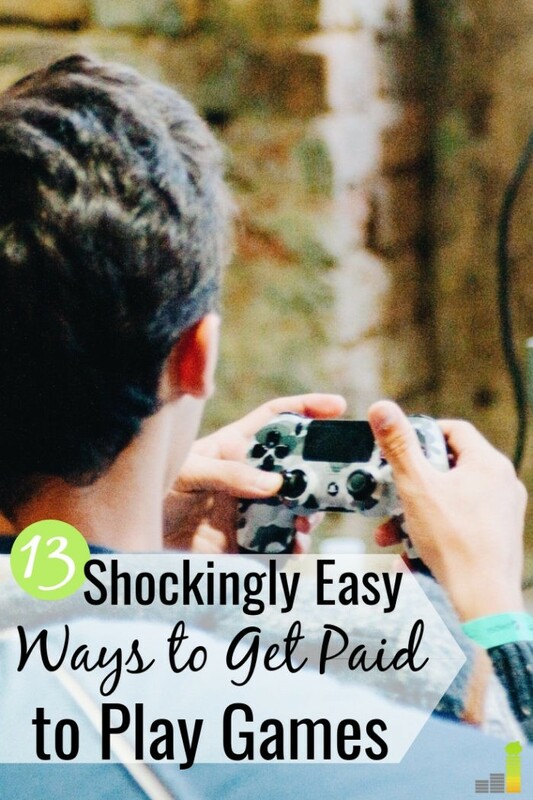 You won’t get rich playing games online, but they offer a great way to monetize your downtime. Many think they need special skills to make extra money on the side. However, there are many ways to earn extra money by doing something relatively simple. 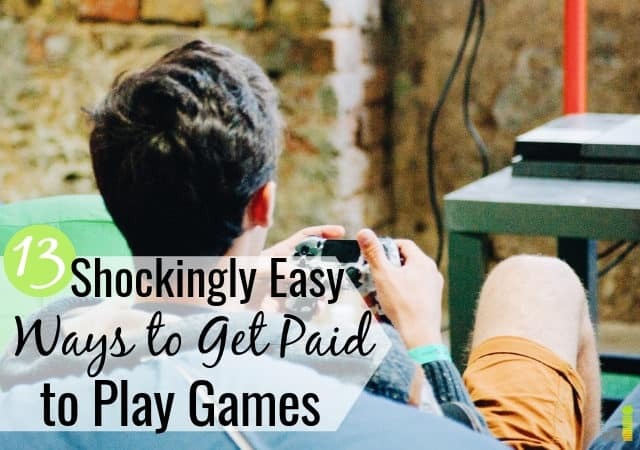 If you want make a little extra money for your budget, this post shares the best sites to get paid to play games. There are many legit websites you can use to play games for money. The most common format lets you earn points to play games. You can also get paid to play video games in some circumstances. We’ll cover that later in the post. Then you convert those points to cash that you can transfer to PayPal or Venmo, or earn free gift cards. Each site works differently, but many let you get paid to play games on your phone or other mobile device. Many also let you play games on your laptop to make money. If you’re a gamer, or simply looking for a mindless way to make extra money, playing games online for money is a great way to earn some extra pocket money. Here are the best ways to get paid to play games online. You can also get paid to play games on Swagbucks. Swagbucks has two free game options: memory games and action games. Both are relatively simple and require little effort. With each game you play, you earn SB (Swagbuck) points you can redeem for cash or gift cards. Swagbucks also offers several pay-to-play games, where you earn up to 18 points per $1 spent. These tend to be slot-type games, or other popular games like GSN, Bejeweled 2, or games based on shows. The games are not mandatory to use Swagbucks, but if you’re already paying for them online, you might as well get some cash back. Check out our Swagbucks review to learn about how the platform works. InboxDollars is similar to Swagbucks and is an easy way to get paid to play games online. There are quite a few free options, and the games work just like the game apps you use on your phone. The best part about playing games on InboxDollars is that you’re able to score extra points in games before you “scratch off” your ticket. There is no set amount to how much you can earn playing games, and you can win up to $100 on those scratch-offs. Pretty sweet. InboxDollars lets you redeem your points for gift cards or cash. InboxDollars does have a $30 minimum threshold for cash. But, on the bright side, they’ll give you a $5 bonus when you open an account. Check out our InboxDollars review to learn about how the platform works. You can also play games for money with InboxPays. They let you spin a wheel to win after your game has been completed. The rewards vary, and the payout threshold is $50. InboxPays pays out in just cash, via PayPal, on the 1st and 15th of each month. With Lucktastic, you can get paid to play games at any time of the day. It’s available as an app for your phone and an app on tablets, so you can play and earn whenever you have some extra time. No need for a computer with this site! So how does it work? While there aren’t specific games to play, you receive a virtual lottery ticket to scratch every single day. You can also earn more scratch cards by turning on the push notifications on your phone and by using the app daily. To win, all you need to do is match three of the winning symbols displayed on your scratch card. While there is no guarantee that you’ll win each day, because Lucktastic is completely free (no in-app purchases), they do try to be fair about rewarding their users regularly. Lucktastic lets you cash out via Dwolla, or you can receive a check or Visa gift card. They also let you redeem earnings for gift cards. If you’re a serious gamer and can keep up in gaming tournaments, Slingo is a great way to get paid to play games. While their tournaments do cost 5,000 tokens to enter (which you can earn by playing the other free games on the site), you can walk away with real cash in hand. You can also earn $5 just by signing up with an eligible debit or credit card. No charges are made to your card, but it is a nice bonus. You can redeem winnings for cash via PayPal. You can also win in two different ways. The first is earning rewards, which you can then redeem in drawings for prizes or contests. You can also join the cash tournaments and earn cash as a prize; however, this makes you ineligible to receive the rewards. The best part of Gamesville is that it’s completely free to play, whether you want to earn rewards or cash. It’s a great website to start with when you first get into gaming to earn money. Did you know that Publisher’s Clearinghouse – the same company that gives those big awards checks – has a gaming site? They do, and it’s known as PCHgames. Not only can you get paid to play games, but you can earn prizes and additional rewards the more you play. You can turn this into quite a bit of a side hustle if you’re willing to put in a little more time. For example, the more games you play, and the more days in a row you play, the more tokens you can earn. You can then use those tokens for entries in sweepstakes to earn gift cards, products, and more. Your tokens never expire with PCHgames, so you don’t have to worry about taking a break. Are you into slots? What if you could play them virtually? Free Slots 4U gives you the opportunity to play slots online, as well as 90+ casino-type games. All of these games give you the chance to earn extra money. Free Slots 4U offers weekly giveaways and slots competitions. You can also play in sponsored tournaments and monthly share-and-win Facebook prize drawings. Want to take things a step further? Join the Free Slots 4U virtual slot tournaments and try to earn more cash that way, too. If you love casino, arcade, or strategy games, WorldWinner is the website for you. With classic games like Solitaire and newer games like Pop and Plunder, there’s sure to be a game you’re good at. WorldWinner awards players up to $500,000 a day, just for winning gaming tournaments. You can start practicing the games on WorldWinner for free. Once you’re ready to try your hand at earning money, you can join a tournament and play against opponents who are close to your skill level. If you win, you can earn some serious cash. Pogo is well-known as an awesome platform for free online gaming, but you can get paid to play games as well. You don’t even need your computer to play. You can also game on your phone, your Xbox, and even the Wii if you have one. Pogo is available on just about every platform, so it’s a great way to earn money no matter what gaming system you have! Just like with WorldWinner, you can play more traditional games, or newer ones you may not have even heard of. While you don’t get paid to play games directly, every day you play you have the chance to earn $50. You can even enter into the $500 jackpot. And if you don’t win, the games are still fun (and free) entertainment, so it’s not a bad deal. If you like the idea of testing video games, Gaming Jobs Online may be for you. You test new games and can earn up to $30 per hour playing them. If you’re big into video games, Gaming Jobs Online is a great opportunity to make money in your spare time. Game Testers is very similar to Gaming Jobs Online, but with a twist. They give you a test to pass prior to paying you to play video games. If you pass and they select you as a tester, you can earn between $50 and $150 per hour! The platform tests games in a variety of ways, such determining if it’s fun to play or if there are any technical glitches. If you have a lot of video games at home you can make money playing those games with Razer Cortex. Assuming the game you’re playing is in the Razer Cortex library, they pay you for the time you spend playing the game. They pay in their currency, known as zSilver. You can earn three zSilver per minute, or up to 900 per day. You can’t redeem the currency for cash, but you can use it to redeem for merchandise like headphones or other accessories. How much can you get paid to play games? Playing games for money is a great way to monetize your downtime, but it’s important to have appropriate expectations. Playing games isn’t going to make you rich anytime soon. But, if you’re looking for ways to earn extra money by doing the things you already do, it can be a good way to start. Should I play casino-type games if I have a gambling addiction? This depends on your particular situation, but in most cases it’s something you want to be careful with. If playing casino-type games triggers your addiction, it’s best to pursue other ways to make extra money. What kind of games do these sites offer? Each site varies, but you can typically expect to find a wide variety of games. Common games include card games like Solitaire, popular games like Bejeweled 2, and other action games. What are the rules to play games online for money? Each site is different. Make sure you read the rules and fine print before signing up to use a site. This will help you know how the site works and how you can earn money. If you’re looking for a fun way to make money on the side, or are a gamer, getting paid to play games may be a good opportunity. Not only is this an easy side hustle, it can be a fun way to pad your budget. Playing games online for money requires little effort. You can do them on-the-go on your phone or while at home on your laptop. Making money in your spare time can be a great way to help reach your goals. What is one unique thing you to do make money on the side? What are some other ways to get paid to play games? How much spare time do you have that you could use to make extra money?